Objective: I can divide fractions by whole numbers. 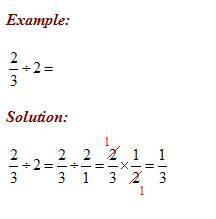 Division of fractions follows the same steps as multiplication of fractions, but there is one additional step. To divide fractions, you need to invert the divisor and multiply. To invert a fraction, reverse the numerator and denominator. The special name given to an inverted fraction is reciprocal. Recall that a whole number has a understood denominator of 1. Read this lesson on dividing fractions if you need help on how to divide fractions. Divide fractions by whole numbers.